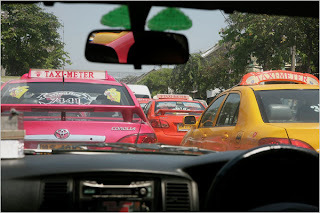 Last month, besides language study, we were able to travel to Korat again to preach for the new pastor there. Please pray for Pastor Tongbai, as he is fighting some real battles right now. Since arriving in Thailand we have had to leave the country every three months to obtain a new "ninety day" visa. This adds quite an expense to our budget and also requires approximately ten to twelve days per year of travel, waiting in lines, etc., of lost time. We recently obtained our "one year" visa but after having it for approximately five minutes, just as we were about to walk out the door, they took it back! This is a view we are very, very familier with. 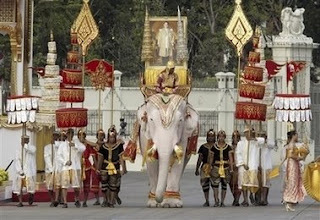 Any white elephants born in Thailand automatically belong to the king. We are so thankful we know the King of kings!God bless you for bein g our partners in prayer and support.